Our Sunday afternoon offers chills and thrills with horror authors Glen Hirschberg and Weston Ochse. Glen’s acclaimed Motherless Child, formerly only available in collectible small press limited release, offers his unique contemporary version of traditional (non-sparkling!) vampires. Check out Glen’s blog for behind the scene glimpses at inspirational music and more. Weston, known for his SEAL Team 666 paranormal military thrillers, brings a new squad to the defense of humanity – Task Force OMBRA – with Grunt Life, a Fantastic Firsts Pick. Christopher Golden noted: "When Weston turns his skills to tales of the military, the words sing with the truth of personal experience." Experience Wes's venture into SF with us! 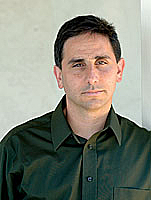 Glen Hirshberg is currently considered a "single author." If one or more works are by a distinct, homonymous authors, go ahead and split the author. Glen Hirshberg is composed of 3 names. You can examine and separate out names.